Is your organization prepared for when a crisis strikes? When a crisis strikes your response needs to be fast, before the situation escalates out of your control. In the digital age, crises happen at light speed and failure to react accordingly can spell disaster for your brand and reputation. Regularly testing, analyzing, and updating your crisis response plan is essential to ensuring your organization is prepared for the worst. 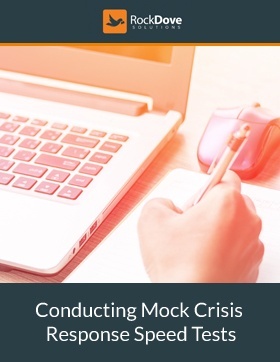 Register now for our new training course: Conducting Mock Crisis Response Speed Tests to discover if your business is prepared to respond to an emerging crisis. Sign up now by filling out the form.